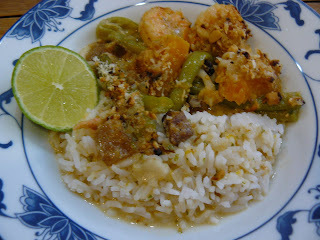 For today's Kulinarya Club theme of Gata (Coconut Cream), I made Guinataang Sitaw at Kalabasa (Prawns, Long Beans and Butternut Squash in Coconut Cream) with a twist, inspired by my brother-in-law in Vancouver. His addition of lemon grass adds another level of fragrance to the dish, and using grated fresh coconut with its juice naturally sweetens the broth. Now for my twist within a twist (blame it on my watching Inception yesterday, which was about a dream within a dream within a dream), I marinated the prawns in garlic and cilantro, added some crisp-fried pork belly lardons, and baked the dish with a browned topping of ground peanuts and bread crumbs. 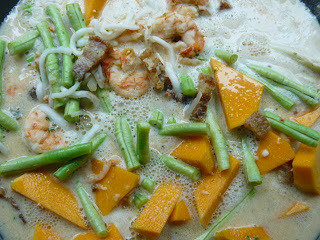 I usually make this guinataang gulay with a thick coconut cream sauce, and sometimes it can get cloying. This version was pleasantly light, and very flavorful. As an option, I would add one or two long green chillies while cooking the vegetables for a spicier dish. Sautee onion, garlic and ginger in oil over medium heat. Add prawns and crispy pork. Sautee until prawns just turn pink. 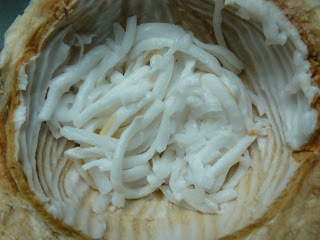 Add grated coconut, coconut water and cream. 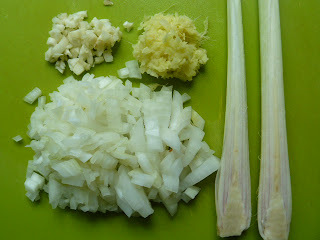 Place lemon grass stalks into liquid. Bring to a boil. 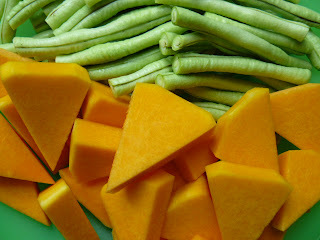 Immediately add long beans and squash, fish sauce, salt and pepper. Mix well, cover and simmer on low heat until vegetables are soft, about 20 minutes. When vegetables are done, remove lemon grass stalks, and transfer to a baking dish. Prepare crumb topping by combining ground peanuts, bread crumbs and a tablespoon of oil to bind. Sprinkle mixture over vegetables and brown under a broiler (watch carefully so you don't burn the topping). Serve with steamed white rice and a slice of lime or calamansi. Oh my goodness, does that look good. What a wonderful combination of texture and flavor! I was already thinking to myself: "Good call on the lemongrass," but then you went and upped it by adding the crunchy peanut-panko topping. Very impressive! I'm definitely going to try this version next. i think it's my first time here.. thanks to kulinarya for making our paths cross. i'm with erika, you already got me at the lemongrass but the addition of crunchy peanut panko topping gave it the further oomph! Love it!..hmm watching inception ceratinly helped haha! great to meet you annie! Hi Erika, Malou, Asha! Anything with coconut is delicious, isn't it? Hi Emily, my youngest follower. You're too funny. Leave me more comments, ok? I love ginataang sitaw and kalabasa,specially with crabs! I can almost smell the porkbelly! You just kicked up an already delish dish to another notch. 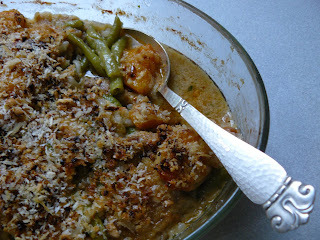 I like your version w/ the bread crumbs and baking/ broiling it like a caserole! BTW, this was a hit with my teenagers, who are usually picky with veggies. Maybe it was the disguise as a casserole. 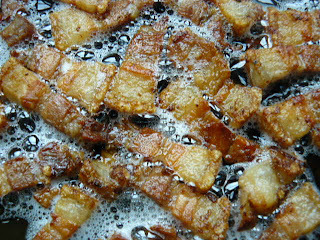 Or the crispy pork bits! 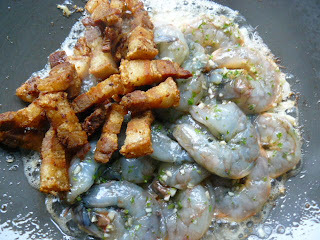 Another post I've missed, I LOVE THE CRIPSY PORK BITS!!! It sings for me...na kakagutom! wow all the crispy pork goodness would make me eat my veggies! I missed this month's theme but would love to catch up and make this.